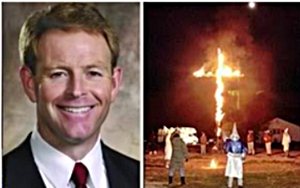 FRC's Tony Perkins Attacks Utah Boy Scouts" "They Celebrate Homosexual Boys!" “If you’re wondering what happens in an organization that doesn’t have leadership or moral courage, look no farther than the Boy Scouts of America. After the BSA knuckled under to activists’ demands, the effects are already starting to show. As FRC predicted, it took no time at all for the influence of the radical Left to seep into a group that now openly celebrates homosexual boys. On Sunday, in an act of defiance, Boy Scouts and adult volunteers marched in Utah’s gay pride parade — even after its chief scout executive said it violated the organization’s rules. Members of a troop chartered by The Church of Jesus Christ of Latter-day Saints ignored the council’s guidance and put their ‘gay pride’ on full display — and in their Scout uniforms. Deron Smith, a spokesman for the BSA headquarters, tried to distance the organization from the troop by saying that ‘these individuals do not represent Scouting.’ But after last month’s vote, they certainly seem to.” – Family Research Council hate group leader Tony Perkins over-reacting to the Utah Boys Scouts that marched in SLC Pride , via email. His head should be exploding any day now.